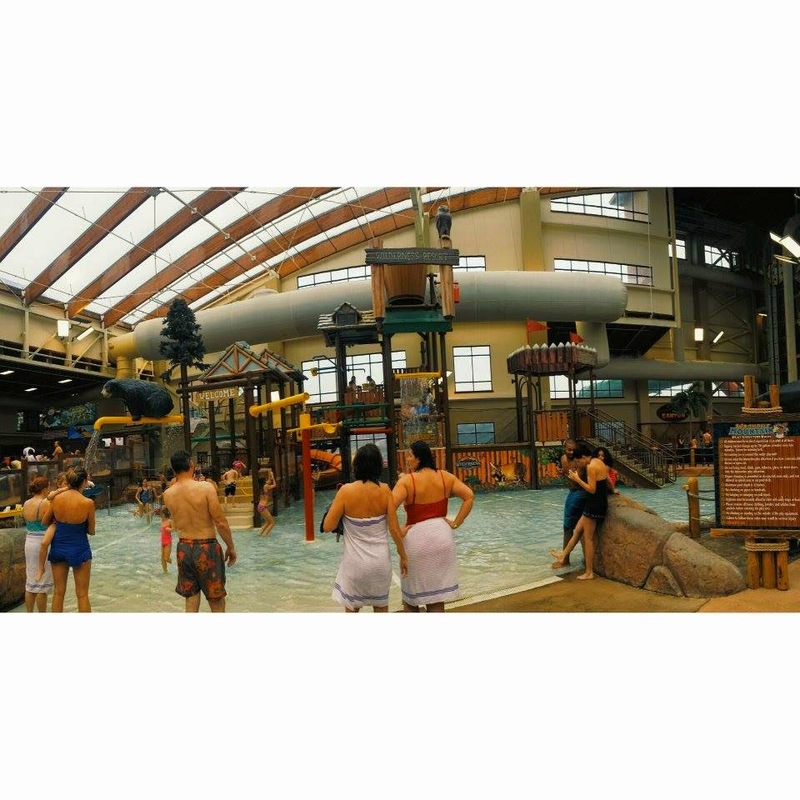 For months we planned on getting together with my grandparents along with my aunt and her two children for Christmas at the Wilderness at the Smokies in Sevierville, TN. For years, we always meet around here because it is a halfway point between Memphis and Williamsburg.Then my grandfather was in a wreck and long story short, because of his injuries they were unable to come. Because this was our Christmas presents from them, they told us they wanted us to still go. So, we did. We have driven by this place for years wondering what it was like inside and finally were getting to see. My mom checked us in and we were booked in the One Bedroom Deluxe Suite with two queen beds, two pull out couches, a murphy bed and one bunk. We didn't need that many beds but it was nice to have the extra space. The suite included a fireplace, sitting area, full kitchen and two full baths. All of the beds had access to televisions to which we love since we all fall asleep to it. 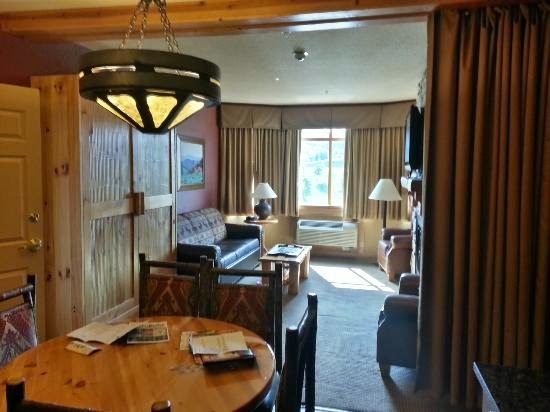 The suite was very nice but the place had its quirks. The Wilderness at the Smokies reminds me of a place I would stay when I would go on church trips when I was younger. The lodge itself is one long building in which all the rooms must be entered from the hallway. Be prepared to hear kids and adults running and screaming down the hall at all hours. When we first arrived we located a luggage cart and started piling all of our items on it. When we rolled the cart into the hall on the first floor in search of an elevator we came to one lonely elevator surrounded by fifty people. While I waited with mom for it, Joe parked the car and the kids ran up the two flights of stairs to the third floor and found our room. Pushing the cart down this long hallway, we see housekeeping littering the way with cart after cart full of towels, coffee and linens. Once we were able to maneuver between all of these workers (it was after six) and wheel the heavy cart down the half mile hallway, we made it. Unpacked, jumped on the beds and got ready to go check out the facilities. We walked again down the long hallway to the end where the water park entrance was and noticed the big signs: No Outside Food or Drinks. I didn't really pay much attention to it because what hotel in which you are paying to stay enforces you bringing an outside beverage while walking in their facilities? No one said anything and I would have been a bit perturbed if someone had. As we approached the entrance to where the fun was, we turned the corner to see flashing lights of the arcade area. People were everywhere and I for one was a bit overwhelmed. We checked out the games, the crane machines, the bowling area, the laser tag and the miniature golf before heading out into the indoor waterpark. We were not dressed for it and got overheated pretty quickly but everything was very exciting so we dealt with it. Water was everywhere along with half dressed bodies. We checked out the scene and afterwards decided it was time for dinner. When we came back to take the same elevator back up in which we had just ridden down, we were graced with a laminated note taped on the door telling us it was out of order not realizing this would be how the elevator remained until we left four days later. I suppose we should have realized something seeing the note was laminated. We trekked up the two long flights of stairs back to the third floor and got dressed for dinner. We wound up eating at a family favorite located inside the vicinity of the outlet mall, The Chop House. It was very nice how they serve the wine they sell. You can either buy a 6 oz. or a 9 oz. glass. The food was excellent and I plan on blogging about our experience later. 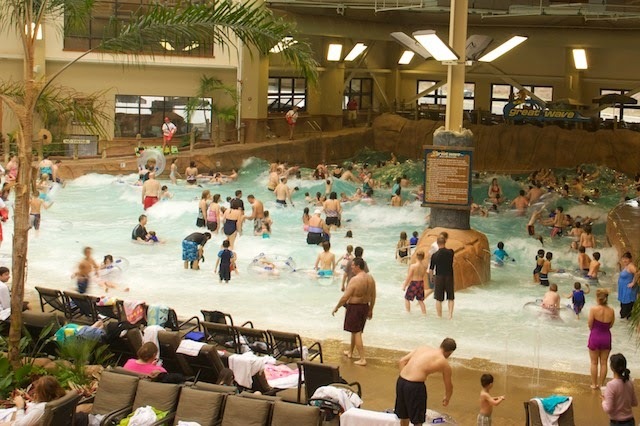 The following days were filled with fun at the water park. We enjoyed The Runaway Canyon more than we thought we would. Being so close to Water Country USA, we have ridden a ride sort of like this and felt it was going to be a slow, family ride. Were we wrong. Once we had all five of us on that float, we FLEW down the tube. The Storm Chaser was exciting but very short and the line was always long for it. When you get in line for these two rides, know the left lane is for The Runaway Canyon and the right is for The Storm Chaser. The girls and I got in the wave pool once but it was kind of chilly. The Indoor Tube Slides were fun especially the purple one. Once when riding in the front, I was completely thrown from the tube. A lifeguard even asked if I was alright. The yellow slide was pitch black when in it. The Smokies Surf Rider was ridden by Sage and Ava but the line was so long they rode once and were done. We hung out a lot in the Magnolia Grove Hot Spa getting warm and soaking our bodies. We had a couple of guest visits including my best friend and roomie in college, Caryn and her fiance Joe. Joe is such a good name. His two boys also came for a day at the waterpark and it makes my heart melt seeing my friend who has wanted a family for years have one. She is already such a great Step-Mom. 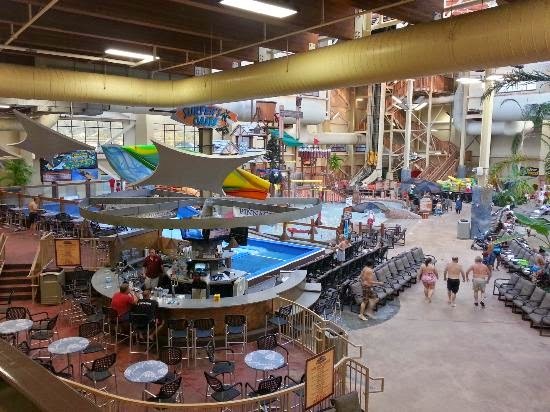 The only way you can enjoy the waterpark if you are not staying is to know someone staying there. If this is the case when you visit, get the person staying at the resort to take you down to the front desk and get your wristband. I believe they are around $40 a person. We also had a visit from my cousin Keith and his partner Scott. We ate at The Thirsty Miner or as hubby Joe likes to call it the The Rusty Coal Miners Thirsty Daughter. I wouldn't suggest it to my worst enemy. My cousin Jerry Thomas and his husband also visited us from Wisconsin. His father and girlfriend came and hung at the bar in the water park. The drink specials were amazing. Jerry Thomas also has a foreign exchange student staying with him for the year whom they brought to visit our family farm near here and to see some of the sights in Tennessee. 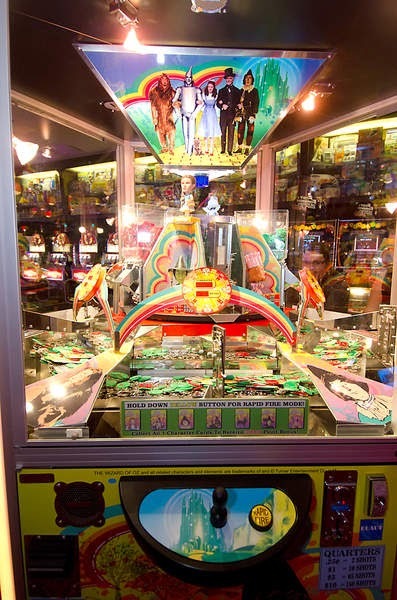 For the most part though, Joe became addicted to The Wizard of Oz arcade game. He sat here for most of the time and then got the rest of us addicted. In the last picture you can see what all we won from this game. The Wilderness at the Smokies was a fun experience with a couple of glitches. We stayed for four nights and if we decide to go here again, two is plenty. Your trip looked like so much fun! !